Have a Sleep Eating Disorder? Nocturnal sleep related eating disorder (NSRED) and night eating syndrome (NES) are two separate conditions, although both involve overeating at nighttime. The main difference between the two has to do with the state of consciousness. With a sleep eating disorder like NSRED, people are asleep. Some doctors categorize it as a form of sleepwalking. In NES, people are wide awake, but have difficulty controlling what they eat. Both are considered eating disorders, grouped along with anorexia nervosa and bulimia. There is some debate about whether the conditions should be viewed separately or together when scientific research is being conducted. There are many similarities between the two. NSRED is a parasomnia or a sleep disorder. People with NES typically experience parasomnias, particularly insomnia. Insomnia seems to be one of the reasons that they overeat at night. Both conditions typically begin at an early age. They are more common in women, often accompanied by depression or shame over their nighttime binges (assuming they are aware of them), and daytime eating disorders are often present. The symptoms vary. In many cases, the sleep eating disorder causes a relatively large weight gain over a short period of time. A sleep eating disorder can result in serious consequences including weight gain and poisoning. People suffering from NES often have problems controlling their weight and may spend an inordinate amount of time focusing on diet and/or exercise. Sometimes, this is true of those that suffer from NSRED as well. This daytime focus on one’s weight and diet may lead to the subconscious desire to eat. But, that is not always the case. The varied symptoms are among the reasons that the condition is difficult to diagnose without doing a sleep-study. In the clinical setting, the patient may not display the sleep related eating disorder. So, it is often necessary to set up a camera in the person’s home. When it occurs in young people, parents usually find out about it. The parents may respond with anger, frustration or confusion as they watch their child eat in a slovenly manner, which is what happens in NSRED. Children and teens with NES usually try to hide the behavior, as is the case with other eating disorders. When a parent learns of the condition, it is important to seek treatment, whether it is NES or NSRED. Medications are sometimes beneficial for both disorders. Low leptin levels are known to be a problem. Leptin is a hormone that regulates appetite. When levels are low, people experience hunger. When levels are high, they feel satiated. Normally leptin levels are higher at night. Another hormone called melatonin makes us sleepy. In most people, melatonin levels start to rise in the early evening. Low levels are associated with insomnia and may play a role in a nighttime or sleep eating disorder. The neurotransmitter serotonin may be involved, as well. Antidepressants called selective serotonin reuptake inhibitors are sometimes beneficial, because they cause an increase in the amount of serotonin in the brain. The drugs can also be helpful when the disorders are accompanied by anxiety and depression. Natural remedies, such as health supplements containing 5 HTP, melatonin or tryptophan may work in the same way. It is important not to ignore a nocturnal sleep related eating disorder. Since the state of consciousness is diminished, people sometimes hurt themselves or eat inappropriate things. Poisonings have occurred. NES should not be ignored either. Therapy helps. People who suffer from it usually skip breakfast and wait several hours before eating. Having meals at regular times, whether or not you are hungry can help. Allowing hunger to continue to rise will only contribute to the likelihood of binging. It becomes impossible to resist the urge to eat if you allow yourself to get too hungry. 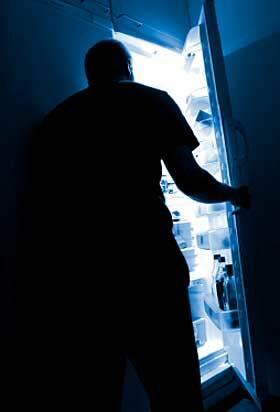 Hunger may be the ultimate cause of a sleep eating disorder.